In August of 2007, at age 67, Paul Prudhomme debuted the first episode of his nationally televised cooking show “Chef Paul Prudhomme’s Always Cooking!” More than a show about recipes, “Always Cooking!” reflects a life-long search for the essentials of good food – the things that raise meals above the level of sustenance to something transformative, something magical – while giving viewers the tools to create that magic themselves. Chef Paul has long been captivated by the effects of food. As one of 13 kids raised on a farm in Opelousas, he learned that slow-cooked, homemade meals could turn squabbling siblings into laughing brothers and sisters. At K-Paul’s, his French Quarter restaurant, he continues to witness the same transformative effect on the guests at his tables. Prudhomme’s quest for the source of food’s magic has taken Chef Paul around the world – sharing meals and ideas with local chefs. And it has taken him right back to his roots. Chef Paul recognizes that the best dishes involve more than technique and a mixture of ingredients; they all reflect a sense of place through fresh, local ingredients. The best food belongs to the locale. It belongs to the season. And it fosters a sense of well-being like the fight-ending meals he recalls from his childhood. “Always Cooking!” lets Paul Prudhomme return a world of experience to a world of viewers. But we know it’s just the first course from a chef whose mission is to create joy through the magic of good food. 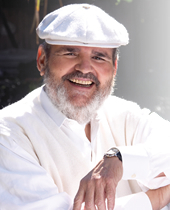 Chef Paul Prudhomme… Peoples Health Champion.